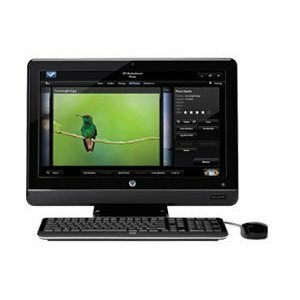 The HP All-in-One 200-5020 Desktop PC is characterized by the presence of Intel Pentium Processor E5400 that is very much favorable for watching movies and creating files. Multi-media projects too can be created with ease. The HP All-in-One 200-5020 Desktop PC is endowed with an attractive design and does not disappoint you in anyway as it performs all the functions that you expect of a full-featured PC. It comes with the keyboard and the mouse that are wireless. Other important features of the HP All-in-One 200-5020 Desktop PC are the built-in HP Webcam that enables the user to video chat live, wireless LAN 802.11b/g/n that enables the user to connect to a wireless printer and a 6-in-1 Digital Media Reader that transfers photos to the desktop PC directly from a digital camera. The HP All-in-One 200-5020 Desktop PC is decked with LightScribe Technology. The other specifications of the desktop include a 21.5-inch full HD 1080p widescreen display coupled with LED backlighting. Digital sound looks perfect when the head phone jack is used. Picture quality is another great characteristic of this elegant desktop. HP MediaSmart Software Suite enables the user to experience multimedia effect to his heart’s satisfaction. The price of HP All-in-One 200-5020 Desktop PC starts at around 37,500 INR.